Have you been experiencing jaw pain? Or are you experiencing frequent headaches while trying to enjoy your favorite activities? You may have been told that your teeth or jaw contribute to symptoms of Temporomandibular Joint Disorder (TMJ), but you are unable to find a solution to ease your discomfort. 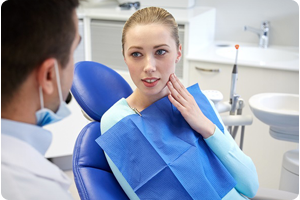 With Perrigo Dental Care, our Hoover dentist is fully equipped with the technology and treatment options to alleviate your jaw pain and frequent headaches. TMJ is a common condition that is seen by our Hoover dentist at Perrigo Dental Care. If you are ready to discover more about your dental health and which treatment options are available to you, schedule your Perrigo Dental Health Exam by calling 205-822-7822 or click here. Schedule Your Appointment With Our Hoover Dentist for Jaw Pain & Frequent Headaches Today! Come experience Perrigo Dental Care. You will see for yourself that our Hoover dentist offer 5-star-rated treatment for jaw pain and frequent headaches in Hoover, Vestavia Hills, Mountain Brook, Homewood, Pelham, Alabaster, Helena, Calera, McCalla, Trussville, Springville, Irondale, Birmingham Red Mountain area, Chelsea, Meadowbrook, Wine Ridge, Indian Springs, Leeds, Moody and Clay-Chalkville, AL. The Hoover dentist of Perrigo Dental Care provides 5-star treatments, including help with TMJ, TMD, jaw pain, and headaches, to patients throughout Hoover, Vestavia Hills, Mountain Brook, Homewood, Pelham, Alabaster, Helena, Calera, McCalla, Trussville, Springville, Irondale, Birmingham Red Mountain area, Chelsea, Meadowbrook, Wine Ridge, Indian Springs, Leeds, Moody and Clay-Chalkville, AL.